Sign up NOW to get Episode 1 for FREE! Sign Up For Your FREE Blind Prophet Episode 1 Kindle EBOOK! Ready for a new kind of hero? Tired of the same old superhero comic books? Ready to try something a little different, that goes against the grain of popular culture? How about a completely unexpected hero, with subtle powers that enable him to intervene before the villain even begins to implement his heinous plans? Time to check this one out! Check out the Blind Prophet YouTube Trailer here! A boy born blind and autistic undergoes an experimental procedure that gives him the ability to peer into the spiritual realm, where demons tempt and angels defend. A superhero who is blind and autistic? A super power that is subtle and unexpected? And, you will be able to check out the origin story in EBook form for FREE? You just have to check this out! Sign up below for your free copy, NOW! 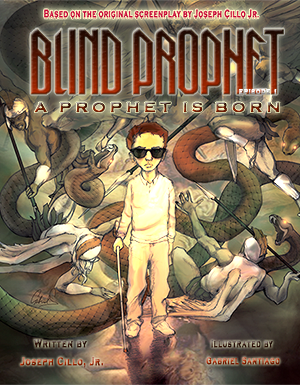 Sign up to get your FREE copy of the Kindle EBook of Blind Prophet Episode 1 - A Prophet Is Born, when it comes out! It will only be FREE for 2 DAYS, so don't miss it! I'm Joseph Cillo, Jr., the creator and writer of Blind Prophet. I'm personally inviting you to download a FREE copy of the Blind Prophet, Episode 1 - A Prophet Is Born EBook when it comes out on for the Amazon Kindle format. I know you're going to love this story! Don't miss this offer.. I hope you will give Blind Prophet a chance!